Giovanni Boldini studied in Florence with the Macchiaioli, a group of artists who were opposed to the teachings of the Italian Accademia as they were too strict. From them, Boldini takes the immediacy and freshness of the French Barbizon School, but he applies these teachings to the portraits commissioned by the high society. After moving to Paris, he became a successful painter of portraits. Boldini’s and Singer-Sargent’s career are often compared, as both were successful painters of portraits around the same time, while the first was in Paris and the latter in London. 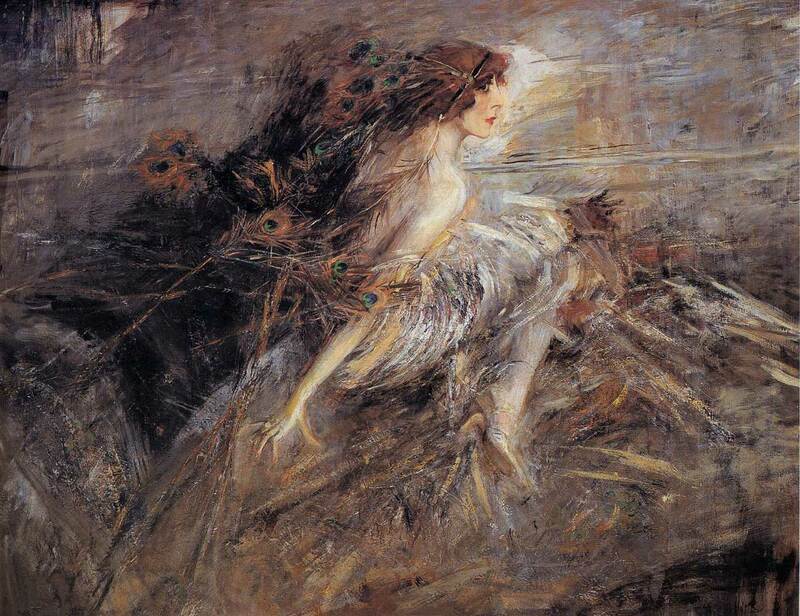 Boldini painted the Marchesa Casati several times. She was an Italian heiress who sponsored artists, but was best known for her eccentricities. The Marchesa used to walk through Paris with cheetah cubs on a leash and attended social events using live snakes as part of their clothing. The painting from 1914 is the most interesting. In this portrait, Boldini combines the realism and the details of the Marchesa’s body with furious strokes in the dress and in the background of the work, making it almost abstract. Although the palette is narrow, the colors are vibrant and expressive. While the dynamic compositions of Boldini brought him fame and recognition, the Marchesa Casati, after moving to London, lost his fortune because of her excesses and spent the last years of his life living in the street. According to a witness, elderly and demented, the Marchesa spent her time stirring the garbage in search of peacock pens. ~ by Álvaro Mazzino on November 16, 2011. Apple has unveiled during the Worldwide Developers Conference 2015 its newest mobile operating system, the iOS 9, that brings with it tons of great features to make iOS device user experience truly awesome. This entry was posted on November 16, 2011 at 09:36 and is filed under Expresionism, Romanticism.You can follow any responses to this entry through the RSS 2.0 feed.You can leave a response, or trackback from your own site.